We’ve got you covered! Brookside Guides know how to have fun AND teach you the basics of fly fishing!! Join Brookside Guides’ experienced and professional guides for the fly fishing adventure of a lifetime in the beautiful mountains of Western North Carolina. 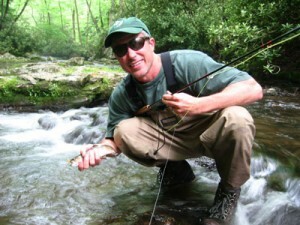 Our WNC trout waters are filled with lively rainbows, browns and brook trout. 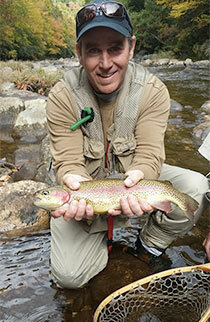 Fish with our fly fishing guides from Pisgah National Forest to the Great Smoky Mountains National Park. Choose a true wilderness adventure and experience an unforgettable overnight back packing/fly fishing trip! Combine fly fishing and camping for a fun-filled family vacation. Be sure to check out the Brookside Guides’ Women’s Fly Fishing School. You’ll also find Brookside Guides featured in Mary Alice Monroe‘s book – Time is a River. Looking for a Unique Gift? Give the Gift of Fly Fishing Lessons. Custom Gift Certificates available for all occasions. It only takes a minute to begin your adventure. Contact Us Online, or call us Toll Free at (877) 298-2568.